The glossy and glamorous have come here for over eight decades. 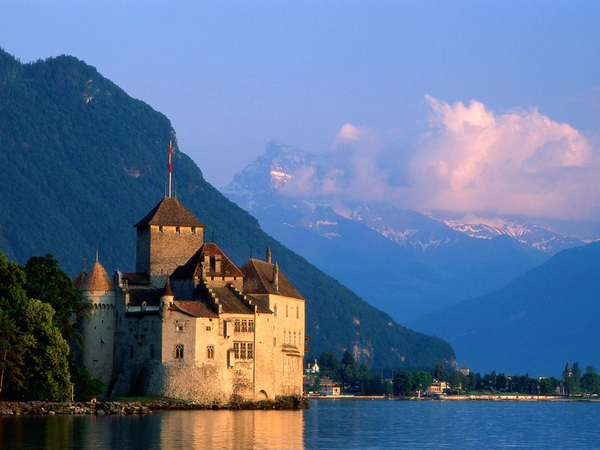 Nestled in the Swiss Alps on Lake Geneva in the French region of Switzerland, it’s easy to see why. They come here for privacy, luxury, and of course, those legendary fresh fetal lamb cell injections. The appeal of the world famous Clinique La Prairie in Montreax is just as powerful today, thanks to the clinic’s own rejuvenation techniques of a new, luxurious $50 million dollar building addition, and a wide array of new treatments. Sure, you’ve heard about it for years. And you’ve heard about “the treatments.” Also, you know of the skincare line of the same name. Yes, the rich and famous love to jet here to revive and renew – in secret. The clinic doesn’t quite promise a fountain of youth, but the experts there do feel like they can help retard the aging process. Getting there isn’t difficult. Flying from any major Texas city to London, an hour connecting flight to Geneva, then taking a scenic train ride to the area of Montreaux is trouble-free. 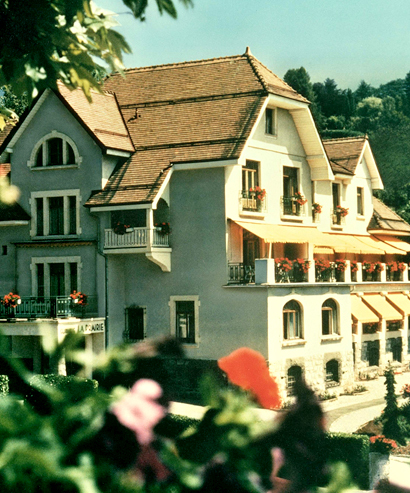 What waits for you upon arrival to the quaint villages of Montreaux is a complex three main buildings: the original chalet facility (formerly a boarding school until the 1930s), a modern medical center built in the early 1990s, and the recently completed Wellness Centre spa complex that rivals any piece of contemporary world-class architecture. And it’s all linked together with elegant terraced gardens. Yes, the retreat is idyllic. My suite’s balconies opened to a view of the docks at Lake Geneva, and beyond it, the Alps. Plenty before me have enjoyed La Prairie, too. People like Marlene Dietrich, Winston Churchill, Charles de Gaulle, Gloria Swanson and Miles Davis benefited from the clinic’s treatments. And at least 50,000 more patients have claims of renewal since the clinic began. In fact, last year over 87 nationalities were represented by the people who flock here to have virtually any possible treatment done. Anything except for heart or brain surgery. That controversial concept of cellular therapy dates back more than 3,500 years to ancient Egypt, yet it wasn't until 1931, when Paul Niehans implemented the idea of cells to be taken from fetal sheep for healing purposes. It’s interesting to note that Niehans was an aristocrat who moved in elite circles and through his friendship with fellow aristocrat Pope Pius XII, word about the injections and the clinic spread rapidly to form the international appeal it retains to this day. Those treatments remain controversial, as they now using lambs instead of sheep. Silence of the lambs indeed. Actually, that cellular rejuvenation, known as CLP Extract, is not as ghoulish as it might seem. “The fresh cell extracts are put into powder form, and then frozen for freshness. The powder is diluted into a liquid substance and then two painless injections are given,” says Dr. Thierry Waelli, the chief physician of the clinic. He goes on to say, “I have one client who is 93, who comes here from Mexico City. And has for over 30 years.” Dr. Waelli believes humans are programmed to live at least 120 years. “I call the cell injection process ‘intelligent doping.’ Why not live to be 100 as a reachable goal? Our patients have reached great success in life and we try to give the answers on how to manage better at any age,” he attests. He also told me that allergies to the cell injections are very rare (they do patch tests to determine it beforehand) and that patients have a speedy recovery time of less than a day. The injection costs, with the stay, run about $20,000 and it’s recommended they be administered every two to three years for longer lasting results. Those under 40 years old need not apply for the injection treatments, but other aesthetic treatments like the popular cosmetic plastic surgeries, can certainly be performed instead. Much more than the cellular treatments, Clinique La Prairie is devoted to helping each visitor retain – or obtain – a higher quality of life. That starts when you check into the facility to meet with a dietician so she can create the best meals suited for your stay’s healthy goals. A choice of three options for four courses is given, and those meal selections change daily, so there won’t be any starving on baby carrots and snow peas here. The clinic’s acclaimed chef Elfried Blaes states “slimming must not be punishment.” Whether dining inside or al’ fresco at the newly completed (and gorgeous) restaurant in the Wellness building, her dishes are seductive to both the eye and the palette. Even the “light” dishes taste as wonderfully seasoned as the regular healthy entrée choices. The experts of Clinique La Prairie are convinced that certain foods and vitamins can play a far greater role in maintaining good health than originally thought by more traditional medicine experts. To complement your new, healthy diet, you’ll want to take in an array of the world class health treatments at the new Spa. Contemporary in scope, these therapies are influenced by old world practices. The Hydroform spa water therapy takes place in a heated salt water pool. Jets of water exude from the walls of the pool, while your extensive water workout ensues. Administered by a water therapy expert, you’ll actually feel your muscles building and the fat lifting. After that, you’ll want to do the Jet Shower. Now bear with me here. You get into a shower while a therapist points a powerful water hose toward you down the narrow 20 foot stall to create an intense water massage effect. Think of it as a Water Wiggle on steroids for grownups. And wear a swim suit that will withstand all the water pressure. Next, it’s onto the Thai massage. My masseuse was a young Thai woman who seemed born to perform the intense two hour massage. Pulling, stretching and all sorts of intense two person calisthenics on the feather mat is just what’s needed to at least feel like you’re turning back the hands of time. Balance that with a soothing sea algae body wrap (from the Mediterranean Sea, naturally) and it adds up to be a series of concentrated, time reversing experiences. These experiences, and dozens more available, are framed perfectly within the new Wellness structure that according to the architect, Jaques Richter, wanted this new building “to exist within the current campus.” At a cost of $50 million dollars, he achieved that with an impeccable three story modern structure that’s built primarily of Swiss materials. The new Wellness Centre combines elements of water, light and minerals. From the blue tiled pools to the numerous aesthetic treatment rooms, and to the Buddha-themed art installations, tranquility is the primary goal, Richter declares. And then there are the world famous La Prairie skin products. Avowed as the skincare nectar of movie stars and the world’s most beautiful people, the brand was sold over ten years ago to a beauty product conglomerate, and even though it still retains the clinic’s name, it’s essentially free advertising for the facility. Now the clinic has created a new skincare system, Swiss Perfection, that rivals the former product line. After trying out the face scrub, moisturizer and eye cream, I actually felt and saw an immediate visible difference. Maybe it was also due to the fresh mountain air and the 60 degree summerc climate. The clinic’s multi-million dollar technology, but not the fetal lamb cells, goes into these products to make them so efficient. The promise of rejuvenation draws new and returning visitors back yearly. Twenty years ago, the ratio of patients at Clinique La Prairie was 80% women and 20% men. Today, that ratio is about 50/50. Asked why the change in percentage, owner Armin Mattli states, “It’s simple. First, men are more clever now. Secondly, everybody wants to extend their lifespan. Eighty per cent of our clients decide to return.” And it’s worth returning to, or even experiencing just once. The combination of opulence, a healthy environment and world class experts should place this spa first on almost everyone’s ‘must do’ list.